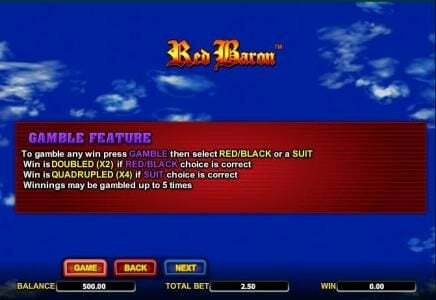 Slot review of Red Baron online slot machine produced by Aristocrat with 243 lines and 5 slot reels. 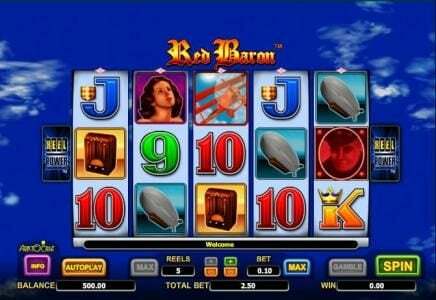 Red Baron Slots has not been reviewed yet, be the first to rate this slot. 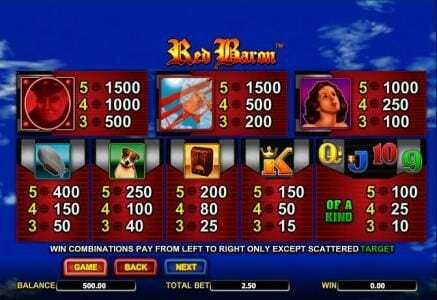 Red Baron, a slot which makes use of 243 ways to win on its 5 reels, was designed by Aristocrat. Among the features which were used you will find Free Spins, scatters and wild symbols, plus a $37,500 jackpot. World War I was a time when many heroes were created, and the Red Baron was one of the most well known of the time. He was a fighter pilot; one of the best ones from a time when fighting from airplanes was still in its infancy period. He had a red biplane, and at its sight his enemies tended to know that their days were numbered. The game has the clear blue sky as the background, this pilot’s playground. 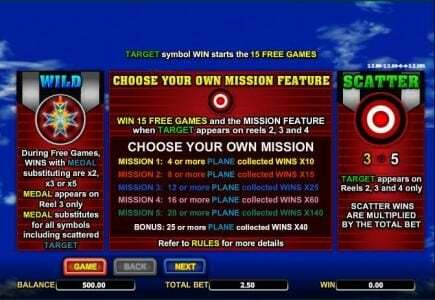 Symbols which have been used in this Slot start with the medal, continue with the target circles, the red biplane, the picture with the pilot, radios, blimps and playing card symbols, between nine and Ace. 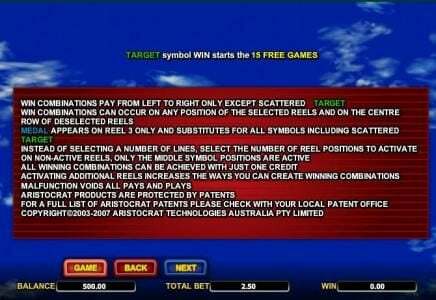 Since the game uses ways to win, 243 of them total, it does not allow for individual paylines to be selected for wagers. 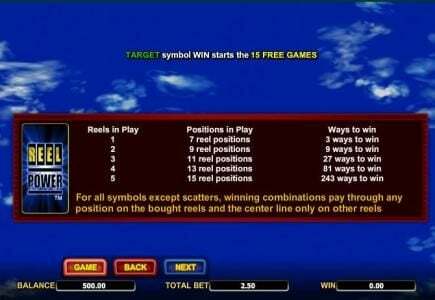 Instead, the player picks one of the predetermined options which includes certain numbers of ways to win, and then decides how much value should be assigned to each coin. The upper limit of the coin value is $5, and up to 25 can be used, so the maximum bet is $125. The top jackpot which can be won with a coin that size is the equivalent of 7500 coins, so the biggest prize is $37,500. With ways to win the symbols have to be near each other, but they don’t need to occupy certain fixed positions, so there are more chances of forming winning combinations. The wild is represented here by the medal of the Red Baron, the iron cross. 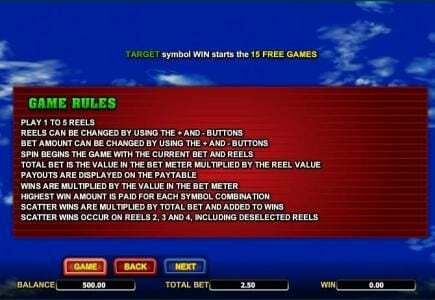 While showing up on the middle reel, it will substitute for other symbols, and if it appears while the free spins are running, it will also offer multipliers, of up to 8x. The other symbol with a special role is the target sign, which is a scatter which is limited to the middle three reels. When all three reels get this symbol, the player receives 15 spins for free. Various missions are available for the duration of the free spins, and they can result in prizes of 10x to 140x, for 4 to 20 planes collected. It’s an exciting game, on a topic that has seen a lot of attention lately, and it’s recommended to players that want a big prize and to enjoy a World War I game at the same time.